Enjoy Some Wine Without Ever Uncorking The Bottle | OhGizmo! 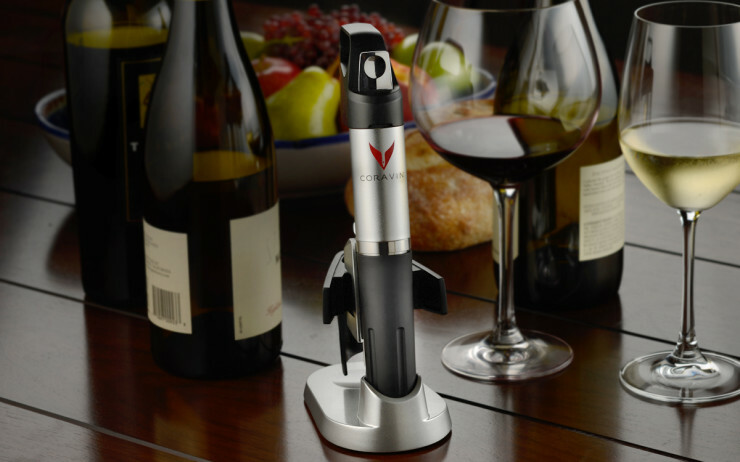 If you like to sip on a glass of wine now and then, rather than to chug a whole bottle like a man, perhaps we can interest you in the Coravin gadget: it lets you extract some wine without even removing the cork. It does this by inserting a thin needle through the cork and allowing you to remove some liquid while replacing the displaced air with inert argon gas. This way the remaining wine won’t oxidize and eventually go bad. The needle is so thin that the cork reseals itself, and the bottle remains as good as unopened for as long as you have it. Granted, you could just try to recork it, but that’s often hard to do and the sometimes brittle wood can crumble. Not good. Coravin is rather expensive at $299 for the system plus $10 for each Argon cartridge and may only be suitable for the more well-heeled oenophiles. Restaurants on the other had would be well advised to take a closer look, since this could allow them to hold a much larger selection of wines that can be sold by the glass.